HOW TO LOG OUT ONLINE WITHOUT INTERNET. In the previous post, we looked at some of the simplest ways through which our online accounts can be hacked. I promised to tell you how to avoid those hacks, and I am fulfilling that promise with this article so read on. Let me start by saying that both malicious and unauthorised hacking are crimes. Therefore, unless you hang out with criminals, hackers are not your friends. And like any enemy, you need to first know how to protect yourself and then master the skills to make sure you are safe from hackers. Hackers are of many different types, some of them do not even know that what they are doing is actually hacking. Nevertheless, when you suspect you are being hacked, it is best to assume the worst. Change your passwords or format your computer if you fear that your security has been compromised. Formatting your computer may sound too extreme, but in the end, this may be more acceptable than having someone have access to all your private information both in your hard-disk and online. There are a number of counter-measures you can put in place to keep hackers at bay and secure your online accounts. Here I explain a simple trick you can use to make sure a hacker cannot access any of your browsing information. Take note that this method only protects your online accounts. To protect data on your hard-disk, consider using password protected folders, data encryption software etc. Clearing your tracks on public computers. Click on the button to the left of the Details label. Make sure all the check-boxes are ticked on the drop-down menu that appears. What you have done is told the browser to delete everything it has remembered about your browsing history. If you have been browsing for about 3 hours, you can select Last Four Hours. The browser history will then be deleted for the last four hours from the moment you click Clear Now. 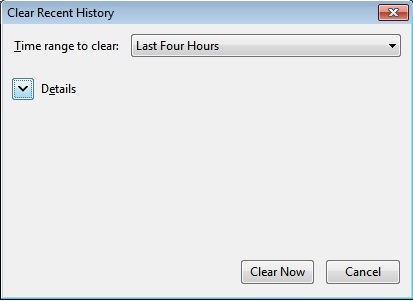 In case you can’t remember at what time you started browsing, then you can opt to clear all history for Today. The final step, if you haven’t already guessed, is to click Clear Now. You are now safe, the computer no longer knows any of your passwords, usernames, browsing history, etc. Whenever you are logging in to any website, make sure that the ‘Keep me logged in’ or ‘Remember me’ check-box is not ticked. Before closing any browser tab or window, make sure that you have logged out of any website you had logged in on that tab or window. Refuse or cancel any requests by the browser to remember any of your information: passwords, history, form data, etc. If you need the browser to remember anything, then save it yourself as a bookmark. The Tags section of bookmarks can be used to save more information relating to the bookmark. Ensure that you have a current, updated antivirus installed on your computer. Viruses can be used to collect and send your private information to hackers without your knowledge. A good antivirus can protect you. 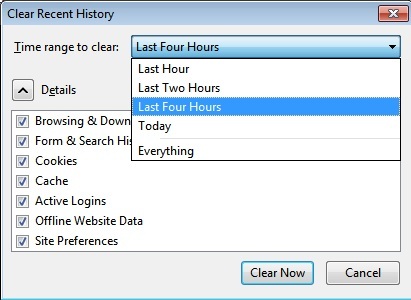 Always ensure that you clear your browsing history on any browser after browsing on a public or shared computer. You should now be able to do this after reading the procedure above.